• Hepatocyte growth factor (HGF) is a global organ repair protein best known for enabling the liver’s unique ability to regenerate itself. • HGF also triggers extensive self-repair pathways within the kidneys, liver, heart, brain, and lungs. • Upon acute injury, HGF is released from storage and binds to upregulated cell surface receptor c-Met in the injured organ. • C-Met is only upregulated in injured tissue. • HGF / c-Met signaling triggers a signal cascade that prevents cell death, activates self-repair and stimulates regeneration. ANG-3777’s effectiveness when dosed after injury is a critical differentiating factor both in terms of clinical trial design and therapeutic window for treatment. • When injury occurs in AKI, HGF is immediately released from storage (blue line) and the body’s reserves are significantly depleted. • An upregulation of c-Met starts at time of injury (red line). 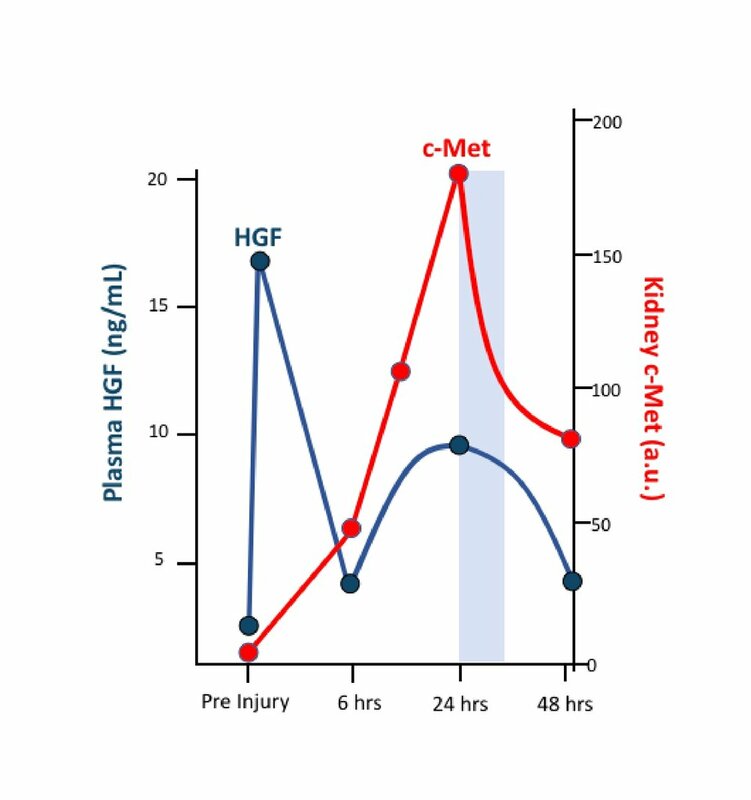 • At 24 hours (light blue bar), there is maximal expression of c-Met receptors presenting an opportunity to enhance the critical activity of this anti-cell death and regenerative pathway. • ANG-3777, a small organic molecule, is an HGF mimetic. • Dosing with ANG-3777 at 24, 48, and 72 hours supplements the depleted HGF, binding with the underutilized but upregulated c-Met receptors. • By enhancing the kidney’s ability to self-repair, BB3 prevents and reduces further renal injury. Angion is currently enrolling patients in a Phase II study (AKI) who undergo open heart surgery that uses cardiopulmonary bypass, also called a heart-lung machine. Patients with existing kidney disease, previous cardiac surgery, compromised heart function, advanced age, and diabetes have a higher risk of kidney injury following surgery. AKI is one of the most serious and frequent in-hospital complications and is associated with increased mortality, need for dialysis, prolonged length of hospital stay, a greater risk of infection, a higher incidence of chronic kidney disease, and therefore, staggering costs to health systems. There is currently no FDA approved drug therapy for the prevention or treatment of AKI. The Phase 2 study, called GUARD (Guard Against Renal Damage) is a USA multicenter, randomized, placebo-controlled, double-blind study in patients that have risk factors for AKI. We have completed a Phase 1 study of ANG-3777 in volunteers and a Phase 2 study in renal transplant recipients at risk for delayed graft function (DGF) after receiving a suboptimal kidney. Patients were enrolled in the Phase 2 study if they had low or no urine output post-transplant. Three intravenous doses of ANG-3777 were administered, the first dose given within 36 hours of transplant, and then 24 and 48 hours later. Renal function and other measures of severity of DGF were assessed over 28 days. The primary endpoint was length of time from transplantation to produce 1.2 liter of urine in 24 hours. Secondary endpoints included serum creatinine, number of dialysis sessions, total daily urine output, number of acute rejection episodes, length of hospitalization, and effect on exploratory biomarkers. - Reduced the need for dialysis. These observations will be confirmed and extended in our ongoing Phase 3 study, called GIFT (Graft Improvement Following Transplantation). Renal transplant recipients receiving a suboptimal kidney are randomized to three intravenous doses of ANG-3777 or placebo, administered daily starting within 30 hours of transplant. About 200 patients will be enrolled. The primary endpoint is duration of dialysis. Secondary endpoints include other measures of renal function.